How to tell if Pork is bad and is no longer safe? What is Salad Oil? How is it different from others? What Chili Paste Substitute that is Easy to Find? How to Reheat Wings in Five Easy Ways? What Goes with Potato Soup to Feed a Big Family? I am not a butcher, and expert on meats, or anything but I certainly know how to tell if pork is bad. All I need is years of experience in buying meat from the market and cooking it myself. The weekly routine teaches moms to learn how to identify whether the pork is fresh and is safe to cook. Nowadays, when choosing the food that I serve to my family, it is required that I should be meticulous. There signs that you need to observe when buying meat in the market for you to be able to bring home pork that is safe to cook right away or store for future use. There are also safety precautions that you should remember when serving food to your kids. Ensuring that the pork is not bad to feed is every mother’s priority. Here are some simple steps to guide you! How to tell if pork is bad? Do these two (2) simple steps for you to know! 1/ Check the package upon buying. 2/ Use your senses. Inspect the meat thoroughly and touch it if you need to. Store your pork the right way! Do you know that if you accidentally serve spoiled pork, this could poison your family? Whoever eats it will feel bad after 2-3 days from taking it in. The bacteria is the reason for being ill. The bacteria in our environment contaminates and attacks the soft parts of the meat and thrives quickly when the temperature is favorable. Diarrhea that can last for more than three days. Along with it comes to stomach pain, cramps, and blood in the stool. Dehydration that makes your mouth feel dry, less frequency of urination, and dizziness when you move. Buying from the supermarket has some advantages. The meat there usually have labels of its package date. 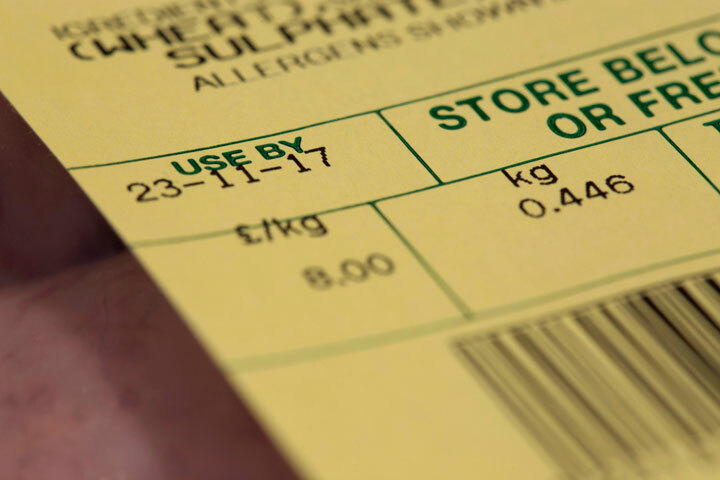 There are two types of expiration date labels which are the “use by” and the “sell-by” dates. Take note that you should adhere to the “use-by” date because after that day, it should be considered expired. The “sell-date” however, means you can still store it for additional 2-3 days in the fridge. Make sure to store or cook it according to the date indicated. Never cook pork that is beyond expiration dates. 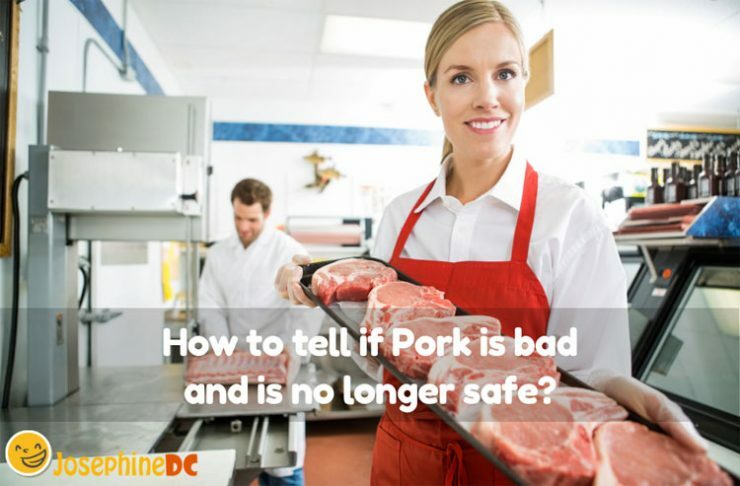 Take note that expiration dates are not an assurance that your pork is safe. However, I have heard that there are stores that change the “use-by” dates to current just to dispose of their old inventories of meat. Hence, use your “guts” when buying. It does not matter if you take longer to decide what to pick as long as you are sure of the safety of the meat that you bring at home. Also, when you see some holes or signs of tampered packaging, let go of it since it may be a sign of old stock, returned item, or a result of mishandling. The holes in the package make the meat vulnerable to bacteria and viruses. If you want to save it for later, make sure to freeze it properly immediately upon buying. Some say it is still safe to do so for at least 4-5 days from the buying date provided you store it in the fridge. However, I do not apply the risk. Sometimes, you can tell when pork is bad by just looking at it. Yeah, you do not need to smell or touch it to know. 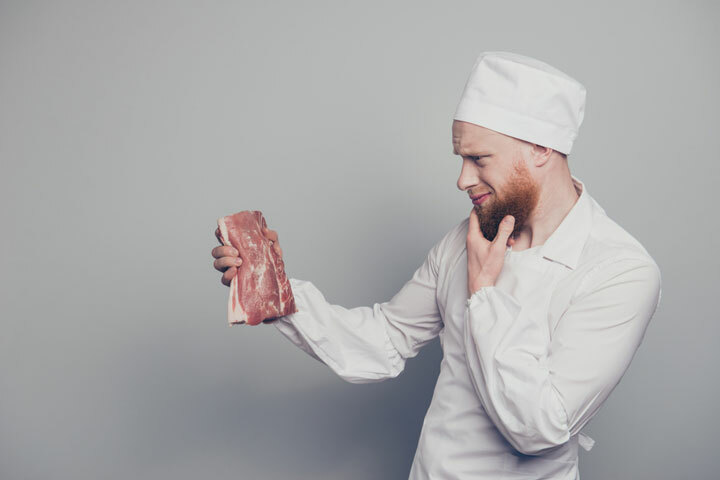 In fact, visual inspection is your first option, and it is amazing that by just doing that, you can give an estimate of how long the meat is in storage. Fresh pork should be grayish-pink or rose to red in color while the rotten meat should look greenish, brown or dark gray. The fat marbling of the meat should be white, hence, if you see it to be yellow or gray, discard it right away. By the way, you would know that the pork comes from the freezer because the color changes from light to darker shade when frozen. You need to know that the meat changes in color after some time. Do you know why it changes in color? The chemical reaction between oxygen and protein creates an oxidation process that causes the changing of the meat color. It happens regardless of the current temperature, or the way you cook the pork. Low temperature, however, can keep your meat safe, but still the same, when I see too much discoloration, I either cut off the affected part or throw the meat away. Trust your nose! When you are in doubt, smell the pork first before buying. I do this particularly when I am buying the meat from a wet market. There are areas where they sell their meat fresh from the butchers and does not come with packaging. Do not worry if it is so since nothing can beat the human senses. Fresh pork should not have a bad odor. If you detect a slight smell of ammonia or any sour, unpleasant odor, do not buy it or rather throw it away. It is not fresh. However, vacuum-packed meat could be an exemption. 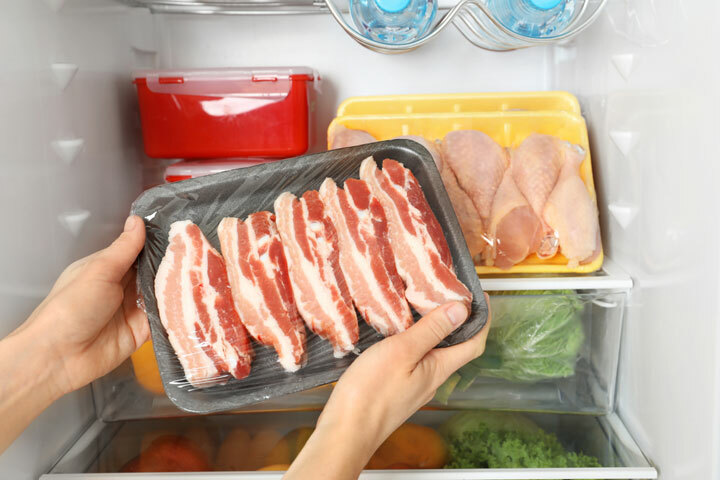 The meat can have a bad odor (acidic aroma) after taking out the plastic wrap that will immediately go away after rinsing the meat with cold water. Smelling your pork is a consistent way to know if your pork is bad or not. This does not only apply to raw meat but for cooked food as well. If you doubt that the food is spoiled, smell it and find out. You should be very particular about this especially on leftover pork meals. Remember that spoiled pork meat will smell worse after cooking. If you are not sure after smelling the meat, you go ahead touch it! The pork should be firm and moist when it is fresh. A mushy, sticky, dry meat, or even when it is hard is an indication that it is spoiled. You will get the hang of this procedure as you find yourself buying meat frequently. If you want your pork to last longer, you should learn how to store it properly. If you bought it with a plastic wrap package, you need to transfer it to appropriate packaging to avoid spoilage. Remember to squeeze the air out before sealing. I suggest using vacuum packing if you have the means. Pork meat is delicious. Protect its flavor by wrapping it up the right way to avoid contamination of scent and flavor from other meat stored inside the fridge. Take note that the appropriate temperature you need when storing meat must not be above 40 degrees F. However when freezing, it should be zero degrees F and eat it not more than six months. I suggest that you cook the meat within the first two months of freezing. Keep in mind that the meat deteriorates as time passes. You must know though that the meat can retain its freshness and quality only for the first three months. Do not expect much from it after that. For cooked meat, on the other hand, you can store it in the fridge for two days, and it is still safe to reheat and eat. Any longer than that, your pork is good as trash. Besides, I do not encourage unrefrigerated cooked food to last more than three hours depending on the humidity of the room temperature. You might as well know that when cooking fresh pork, the internal temperature should be about 145 degrees F.
Separate or isolate pork meat from other food stored in the fridge to prevent contamination. Follow the safety rules in storing food. When working with pork, do not forget to wash your hands, utensils, surfaces such as the cutting board and knife always. Do not cook the meat fresh from the ref. You must give enough time to thaw. With this, I recommend thawing meat in the fridge and not at room temperature. Let the cooked meat rest before consuming. Give a few minutes for the fiber to relax for a tastier and juicier meal. As a summary, learn how to tell if pork is bad by checking the buy date and by using your senses. To be 100% absolute, touch it! I also include the proper way of storing as a bonus to keep your pork fresh longer. The simple steps are applicable for not only fresh pork meat but also for sausages, bacon, and another form of pork meats sold anywhere. Share this article to people you care about that needs to know. Do not take any chances. It is better to be pro-active than sorry. Cheers!